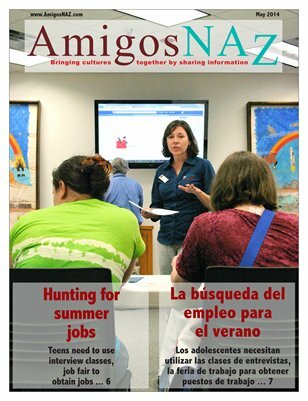 The May 2014 edition of AmigosNAZ opens with a cover story on programs available for youth to help them improve their chances of getting a job this summer, including a tip sheet on do's and don't for job hunting. The edition also includes comments from supporters and opponents of a proposed student housing development on the site of a mobile home park near downtown Flagstaff; details on the Market on the Move fresh produce program coming to Flagstaff on May 7; an update on the search for a director of Inclusion and Multicultural Services at Northern Arizona University; details on the annual Science Camp at Killip Elementary School in Flagstaff; information on ‘DREAM Act to DACA: Debunking Myths;’ and a commentary by AARP Arizona on the options still available under the Affordable Care Act. All this and more brought to you by AmigosNAZ — Providing information for and about the vibrant Latino community in Northern Arizona.